Affordable Accoutrements: And a Hummel New Year! Depending on where you live and what/how you celebrate, I hope you've all had a wonderful Christmas, Hanukkah, Kwanzaa, Boxing Day, St. Lucia's, and Yuletide! And now it's time for New Year's Eve Dinner! We're in the solarium again, and the table is set on a beautiful, sunny (but COLD) afternoon. I'm still in Christmas mode, so I selected a warm shade of gold for the tablecloth. It has a woven holly & poinsettia design, and it's the perfect size for the table ... or is it? I bought two of them a couple of years ago at an antique mall. They were new in the package and on sale. I put one on the table today, and it barely covered the length! Then I remembered that the table always has the expansion leaf in now. I took both tablecloths, folded under the ends that face the center of the table, and covered the "seam" with an ivory-colored runner from Dollar Tree. The centerpiece is recycled from last week's holiday dinner. I replaced the evergreens with dried roses, ornamental grass plumes, and dried hydrangeas from the garden. I placed the ivory and gold holly-patterned oval ceramic container (99 cents at Goodwill) on a decorative mirror ($5 at an estate sale). The tall crystal/silverplate salt and pepper shakers are "Diamond Fire" by Mikasa, a new in-the-box-bargain from a local thrift store. The napkins were purchased at Belk on clearance (70% off). I folded them into the shape of roses and placed crystal tealight holders in the center. If you don't know how to do this particular decorative fold, you can see a video tutorial HERE. It's really easy and works well with a small wrapped gift in the center ... or an ornament, a painted pumpkin, a flower, a roll, a cupcake ... whatever you choose will look great! The flatware is "Garland" by 1847 Rogers Brothers (1965-73). This service for 12 was purchased on eBay from a listing by a California pawn shop. It was in the original silver chest and appeared never to have been used (not a single scratch on it). The Hummel figurines belong to David. They were his mother's, sent to her through the years by a sister who lived in Germany. I must admit that I'd never really looked at them before. They sit in their lighted case (rarely lit) in the sitting room. The table seemed unfinished. I looked around for something small and decorative to add ... and there they were. I impulsively grabbed a few of them, scattered them around the table, and decided I liked the effect. Why have I been ignoring them? They're really rather charming, aren't they? You can read about Hummels HERE. The china is "Trudy" by Noritake (1971-86). A young bride and I chose it a very long time ago. I'm hanging on to it in case our little granddaughter wants it someday. The background is ivory, but it looks white in the photographs. The iced tea and water glasses are "Puritan" by Fostoria (1957-71). I'm using what was intended as a tea glass for water and the tall water glass for wine. I've added an inexpensive champagne flute to each setting. I like the twisted, sparkly stems of the flutes. I see these at thrift stores frequently, usually priced from 49 to 99 cents each. I enjoy mixing newer thrift store glassware with vintage pieces. It helps keep things from getting too serious, lets us be more creative in our table settings, and allows our guests to feel more relaxed. 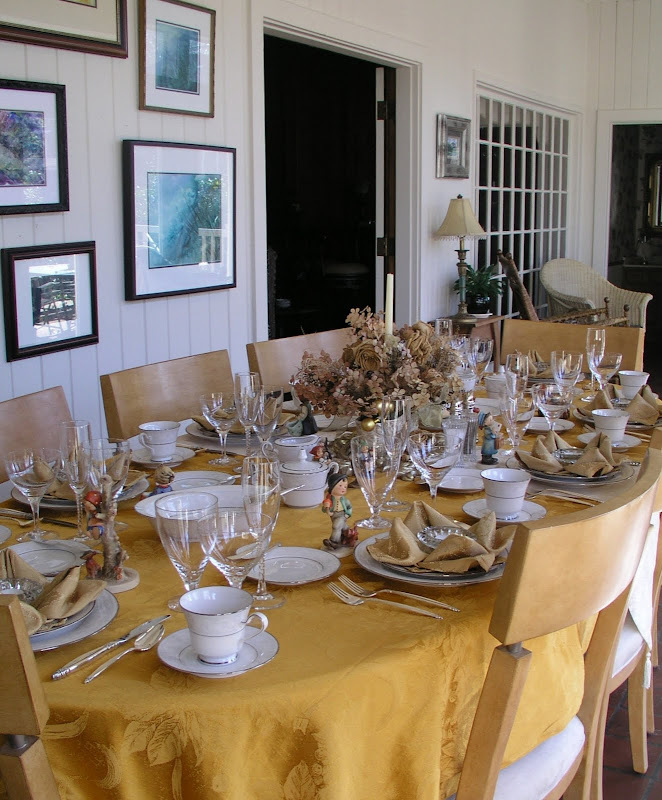 Placing sugar bowls and creamers on both ends of the table is a nice courtesy for guests. It helps miminize interruption of (fascinating ... one hopes) conversations. The champagne bucket is waiting in the "pass through," ready for the ice and chilled bubbly! I hope you don't mind seeing these brown flowers once again! We didn't want the wedding guests to spend a lot of money on us (crazy kids! 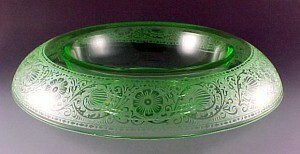 ), and Noritake was a lower cost alternative to a similar Lenox pattern. I think the quality of Noritake china is excellent, however. In this shot, you can see how transluscent the cup is. The votive/tea light holders are readily available at thrift stores. I think I've seen them at every Goodwill store I've ever visited. I assume they have some lead content; they're heavy and clear, with a lot of sparkle. The little band leader may be my favorite. Why have I never looked at these before? The butter spreader is a different silver pattern, King Cedric (1933). It's OK to mix silver patterns on the table. Older guides said to mix serving pieces, but NOT to mix within a place setting. I ignore the latter guideline ... frequently. Another look at the glassware. Puritan is such a clean-lined pattern that I think it can work beautifully in almost any table setting situation. The imaginative detail of these little figurines is really rather amazing. When a boxful of them came into his life, my friend, Julio of Beaux Mondes Designs, was even less intrigued with Hummels than I have been (until I played with them today). Read about his funny/awful learning experience HERE! This one must be playing "Koom Bah Yah!" Ready for the guests to arrive. When they're seated, guests can blow out their candles and make a wish. It could take the form of a New Year's resolution ... or just a dream ... a hope for a loved one ... or for a better world. Good night and Happy New Year to you all!!! 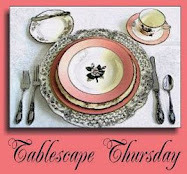 It's almost time for another Tablescape Thursday with our gracious hostess, Susan of Between Naps on the Porch! Make sure to visit Susan and all her talented tablescaping participants! Again, Happy New Year! Thank you for stopping by! Another beautiful table. What a great idea with the table cloth. I enjoy your table scapes so much, thank you for sharing them. Beautiful! I love the Hummel figurines. My wedding china is very similar from the same era. Love how the gold tablecloth plays off all the silver. HI Dear Bill! Another beautiful table! I love those sweet little Hummels. They have such personality! What a treasure in these David has! You are so inventive with those table cloths and the runner and your taste in combining all things just amazes me! You have such lovely things. My husband has just retired and we're traveling and I wanted to make a few visits! We're at The Breakers in Palm Beach - so it's decadent! Bill-You are the master of capturing the light in so many perfect stages! I love the Garland pattern--it is different from most of the ones I am familiar with. I am very impressed with your napkin folding and love the Hummels--I think the band leader is my favorite too--such stylish hair :) Wishing you a happy and healthy new decade!!! Bill, I love the way you photograph your tables. The glassware is so full of sparkle and light. Your closeups are good enough for Nora Desmond. I hope 2010 is full of love and happiness for you my friend. Stay healthy and happy and may you find many estate sales to share with us. Just love Hummel and your collection is amazing. Your tablescape, as usual, stunning. Bill, your table is stunning, as always. The centerpiece is really beautiful with all the dried hydrangeas and roses. The Hummels add that little extra touch you always manage. Amazing, stunning, gorgeous. WOW! I want to come over for dinner! Your pictures are wonderful, but the dialogue makes them so much better! O, I'm telling you, Bill...you just entertain the hell out of us. I just LOVE coming over and I find myself hanging on every single word. You are so knowledgeable on so many things and I always learn something from you. I would dearly love to be an invited guest at one of your beautiful dinner parties. Every single thing on your table is stunning..the little Hummels are adorable and look as if they were made for this table setting. I always leave wanting more!! And, that's a GOOD THING ! I love the color combinations. The Hummels are delightful. Another gorgeous table, beautifully photographed! It's lovely Bill. Whenever your "staff" is free, please send them over to me! I sure could use a little extra help. The napkin fold is amazing and with the candles aglow - spectacular. Hope that you had a blessed Christmas and that a wonderful New Year is just around the corner. I look forward to a new year's worth of posts. It another great tablescape Bill and just so breathtaking. Love the Hummels and the dried flowers. I am in awe of your talent! Bill, I love coming by for visits to see all of your gorgeous table settings. This one is so pretty and formal, yet the addition of the sweet Hummels makes it seem a little more casual. Either way, the table is set perfectly for a New Year's Eve dinner.. I have never really been a fan of Hummels, but seeing them used in this manner really made me smile. Hope that your evening will be a success and that the New Year brings good things to you and yours. Happy New Year! May it bring you happiness, good health and abundance. I am so glad I stopped by. Your table is gorgeous. You are so inventive with the tablecloths, and to think the runner from the dollar shop goes so well with your pretty gold linens!! I love your new flatware and your 'old' china! The Hummel figurines are just precious! And I am definitely going to check out the tutorial on the napkin folding. I love the rosette! Wishing you a wonderful, happy & healthy New Year!! Very classy! And I adore how you combined the Hummels with the gorgeous table setting. All of the colors go perfectly together. (sigh) you are just amazing!! Have a very Happy New Year brother! I can hardly wait to see what the future brings each of us!! Stunning and charming at the same time. Your photography is wonderful too. Bill, one of my favorite things about your posts is that you show your tables though the hours in various lighting. It makes for a stunning presentation. The little Hummels are dear! I've never paid much attention to these little figures myself, but have to say they steal one's heart. The little postman and the girl with the black bird are my favorites. Lovely as always. The tablecloth is beautiful against the plates and the way you folded the napkins is just fantastic! What a beautiful table creation!! The Hummel figures are wonderful and would be a good conversation piece at the meal. I love the way the sun has caught the postman. Great idea of having the runner to cover the join in the beautiful gold tablecloths. I have bought a few table runners from Ebay, I find the ones bought in the shops in the UK are cheap fabric along with the cheap price. Has your grand daughter inherited your artistic style? When I have some time I am going to sit and watch the tutorial and try and turn a plain napkin into a piece of art!! Best wishes for 2010 to you and your friends and family, Jackie in UK. Bill, as usual, your table is absolutely stunning! Love every aspect of it. You are a master in the classic, classy table settings! And yes, Noritake is good china even though some people turn their noses up at it! It is good quality and the patterns are really varied and interesting. I am always eager to see what your table looks like this week! It may have been cold in the solarium but the sublime golden glow of this table warms it up nicely. Very elegant, Sir William! What a great idea to cover the seam of the two cloths with a runner like that! I have several tablecloths from our FL home that won't fit the 60x60 sq. gathering table in our sunroom. I'll have to see if I can make it work like you did. Thanks for the idea! Thank you as well for the link to the napkin folding video. I loaned out my book on napkin folding & never got it back! :( This video & others like it, will certainly help me to remember how to do them nicely. The flatware is beyond words....what a lucky find...and the china is perfect with it. Both appear very delicate in design & texture. I think "Trudy" was the china my sister had & has since passed it down to her son's wife. I will send her a link to your site, as I'm sure she would enjoy seeing it displayed so beautifully. I'm thrilled to read that you are saving it for your granddaughter. I know she will treasure it even more than you do. I am smitten with the enchanting little Hummels. I only have one that a patient gave to my husband as a "thank you" gift. The last photo of the table in blazing spendor is so captivating, it makes me want to just melt. BRAVO~Encore~Encore! Thank you for brightening mine by sharing yours! Bill....this is fantastic. I love the Hummels...just make sure your guests don't think them as FAVORS!! And that silverware...that is really pretty. So delicate. Your table is scrumptious as always! Have a wonderful New Year!! I enjoyed the hummels visit to your tablescape. I have a few that I received from my MIL. Most went to her other kids since they had purchased them for her. The ones I have went through a house fire years ago and she cleaned them up. They were made from original molds back in the 50's I think. I love the big one I have of a goose girl. There is something heart warming about them. Yours kind of came to life with the changes of the lighting ! I just found your website - love your table. I was never a fan of Hummels, but seeing them this way - used on the table instead of standing quietly behind glass in a case, I am surprised at how charming they are. Your tablescape takes my breath away!!! Hummels are so charming...my sister collects! Amazing how many treasures you have around your house that we take for granted! Hi Bill, Happy New Year to you! I loved your table setting and the use of the Hummels was brilliant! I also enjoyed your Christmas party post, I love being challenged with a short amount of time. It's amazing what we can accomplish and you did a fabulous job...as usual! Hope you had a fabulous Christmas and looking forward to more beautiful designs from you in the new year! Another gret one! Have you thought about having a book published of your tablescapes? You outdid yourself. Your table is stunning. As a novice photographer, may I ask what kind of camera you use? I am so glad I found your blog this year. You always do such a stunning job.....this one is the tops! Never in a million years would you guess that it's cold outside with the warmth in this tablesetting. I only have one Hummel, but I come from a long line of Hummel collectors. My mother would dearly love this, as do I. Bill, I have finger fatigue scrolling down through all your comments! LOL.. It is just beautiful..I kept waiting to see what the china was..the lines are so similar to my wedding Noritake (Heather). I love the silver too.. It looks very New Year's Eve worthy.. I don't drink so the tea glass will be fine for my Sierra Mist Free, my bev of choice! Thanks for another wonderful tablescape..Happy 2010! Your table is just beautiful! I saw a mirror today at goodwill like the one you have in the center of your table, I am going to go buy it tomorrow it was $1.50. Thanks for the great ideas! Happy New Year! K! I am soooo copying that idea of the mirror under the centerpiece. Love the Hummel on the table they add just the perfect touch of whimsy! Beautiful table. I love the color and the little Hummels were the perfect touch. I absolutely would die for that flatware (Of course then it wouldn't do me much good would it?). It's so pretty. I also liked how you used both tablescloths and covered the seam with a runner. Very clever. Thanks for sharing that tip. I am so glad you've "discovered" the little hummels! They are indeed very special and such a treat to use on this table. I don't collect them but my mother does and it's always fun to see what she's added new to her collection. Thanks so much for sharing your table and have a very happy new year! Hi Bill -- you just amaze us week after week -- every one of your tables is so elegant and those look like some happy Hummels because they get to play in the dishes with you -- lucky little things! Happy New Years! Wowie Zowie!! Everything is so elegantly lovely Bill. Love all your pieces and how you put everything together. The little Hummel figurines add such a sweet touch to the table. That flatware pattern is very cool. A very Happy New Year to you and yours!! Goes without saying the table is CRAZY GOOD! My favorite are the little shiney faces(from the candle light) on the Hummels...Priceless. My Favorite Grandmother collected Hummels...she had many. Fabulous! Love how you have captured the child-like quality of the Hummels and yet made them look like they fit right in on your elegant dinner table. They add such a special touch. 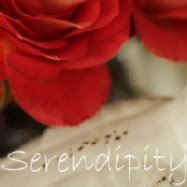 Your photography is breathtaking, especially in the candlelit pics! Charming! The Hummels are such a sweet touch. I especially love the little girl with the sacks, I used to know their names as my Mom had a large collection, but I've forgotten them all now. You and David have quite a few treasures there. Your New Year's table is beautiful! And I love the 'Garland' flatware, it's really a very pretty pattern. I was looking at your last post again and your home is so elegant! Beautifully decorated (and I don't just mean the Christmas decorations, I'm talking about your 'home decorating')! Fabulous again! I always love your mix treasures. Love the flatware, and the beautiful bone china. It is all just perfection!! I always look forward to your tables and I was not disappointed. It is sheer elegance and I love it. Your photos as always are perfection and I enjoy seeing your table in the differnet lighting. Great Hummel collection, you really captured them and the flatware...love it. Bill, you are the true master at combining stunning elements and creating mood. I love everything, and your idea to place the Hummels is charming. My aunt has Hummels, and they are quite little works of art. Each one is so incredibly expressive. Hi Bill~ ~ ~Lovely table again. The addition of the Hummels add a sweet whimsy to your settings. Love it. My MIL has this Noratake set also and it's so versatile. I've got to try the napkin folding it's so nice looking with the spot in the center for a gift. I love giving my guests a gift to take home with them. Looking forward to the new year and wishing you the Best. Bill...what a gorgeous tablescape...love the warmth of the gold and creams...beautiful with your dried floral centerpiece! The Hummels really are adorable, aren't they?! I love the softness and old world look of how they were painted. That truly is quite a collection. I have a few but stopped after collecting just a few...afraid of getting too deep into it. :-) I will have to watch the "rose napkin" video...your napkins really do look like little roses! Always love hearing about your bargains...you find the most beautiful treasures! Your candlelight shots at the end are really beautiful...they conjure up thoughts of mystery and romance, mixed with a bit of intrigue. Each of your tablescapes is a story in and of itself...don't you think? Happy New Year! May your blessings be many indeed. Happy New Year! Some of your little friends live at my house, too. I LOVE them all because many were my grandmother's, some came from a favorite uncle, and my late husband used to surprise me with them. I even bought a few myself in Grand Lake when I finished the school year as a "reward". I appreciate all the effort you put into making our visits so delightful and increasing my knowledge about so many things. Thanks for sharing! Too bad you did not create this post before I sold off our Hummels. This would have been a great way to put those little people to work. They fit perfectly in the setting. Papa Dan loves the table as well and is upset that I did not think of using the Hummels this way. Thanks alot Bill*smile*. Your china,flatware,stemware and napkin arrangement are terrific. Wishing you and your loved ones a very happy New Year. Your tables are always so gorgeous. I actually have a few Hummels, also sitting in a cabinet and ignored. My husband bought me one for Christmas for a few years when we were first married (until I asked him to stop). I would never have thought of using them on the table, but I like the look. Absolutely stunning, what a beautiful way to ring in the new year! I like how you folded the napkins and added the votives. The Hummels add a special touch, and I like the way the light hit the one that "wants to tell us something!" That silverware is gorgeous. I think my aunt had that same china. Hope you're having a happy New Year.